Fire-resistance directories, published by third-party testing laboratories such as UL and Intertek, provide details on more than 250 listed systems. However, every building has its own unique design challenges. While a listed system is a good place to start, architects, contractors, and firestop installers all need to be sure that the system used for a project includes the following required components. Mineral wool insulation. Of the many insulation options available, mineral wool is best suited to the challenges of perimeter fire containment, primarily because its fibers are noncombustible and products made from mineral wool have extremely high melting temperatures (upward of 2,000 degrees Fahrenheit).5 Components protected by mineral wool insulation are less likely to fail than components protected by insulation with a considerably lower melting point. A successful design will include mineral wool installed at the required densities and thicknesses both within the curtain wall spandrel and in the interior joint; this is the only material that has been tested and proven to protect the spandrel and interior joint. 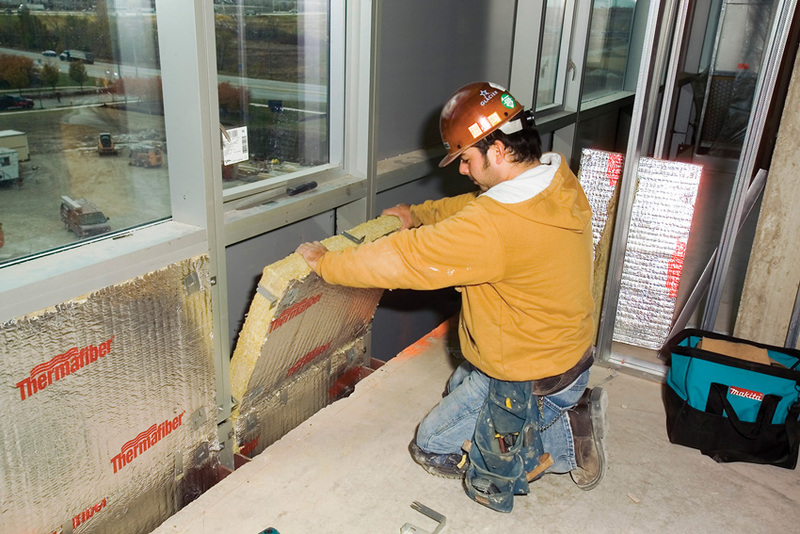 Manufacturer-approved installation of the mechanical attachment of mineral wool curtain wall insulation. Different projects will include different fasteners, which will require different fastening methods. The fasteners must be installed per the tested system that is being referenced as the basis of design to make sure that the system functions as it was designed in the event of a fire. That is, the system must be ASTM E2307 tested and approved for fire, thermal, and structural movement. Backer reinforcement at the safe-off line. All systems require that the mineral wool have some form of reinforcement at the safe-off line to prevent the spandrel insulation from bowing from the compression force at the safing joint. The reinforcement is also used to ensure a tight seal at the interior joint; if the joint isn’t sealed properly, the spandrel insulation will flex, which will create gaps or seams where flames and gases can get through to the floor above. Most listed systems reference either a 20-gauge galvanized steel T-bar, L-angle, or hat channel. However, other systems use different components such as additional insulation or other tested and approved components to reinforce the curtain wall insulation. Testing has shown that even steel panels will be a failure point at the safing lining if they are not properly reinforced. Compression-fit mineral wool safing insulation. This must be installed within the void between the floor assembly and the exterior curtain wall insulation. The insulation must have the correct density and compression in order to properly seal at the interior joint. Mineral wool insulation mullion covers. Exposed vertical aluminum framing must be covered with mineral wool insulation. This component is often seen as not contributing much to the assembly performance—and sometimes is removed from the system if it gets in the way of aesthetic elements such as interior finish or a window shade pocket. However, the covering is an essential component in that it protects the mechanical fasteners that keep the spandrel insulation in place. Moreover, in the event of a fire, it helps retain the exterior wall in position so that the safing joint materials will block fire and smoke. Without this component in place, the exterior curtain wall element will fail in less time than if the framing is protected. Firestopping sealant. The final required component for a perimeter fire-containment system is that smoke must not be able to pass into the safe-off area. 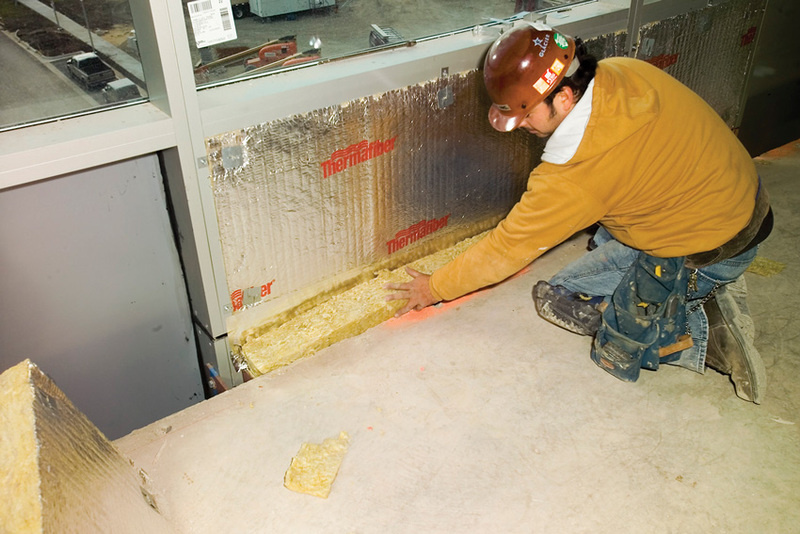 To prevent smoke from entering the safe-off area, smoke sealant must be applied on top of the safing insulation on the non-exposed side of the fire-containment system. The number of required components for a perimeter barrier system and the overall diversity of building designs mean that specifying the perfect firestop system can be challenging. After all, a firestop system is only as strong as its weakest link. Architects need to be absolutely certain that the system they use will work for their specific construction details. A major part of the problem is that third-party laboratories such as UL and Intertek simply cannot provide a fire-resistance directory that covers all of the possible component combinations from different manufacturers or evaluate each possible system. Different projects may require different configurations and ultimately different component providers, and so there may be no simple way to test each and every system. 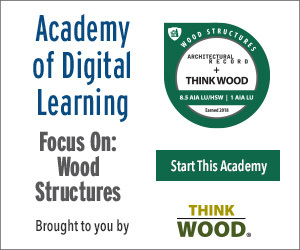 Architects and construction professionals need to know the local code requirements. They also need to specify to those requirements; this means understanding all of the fire-rating reports from each manufacturer. The general contractor needs to make sure that nothing has been improperly substituted: if a code-approved material is required, it cannot be replaced with something else. The system must be properly installed for the specific space. In the case of a perimeter fire-containment system, even the smallest gap can provide enough space for flame or gas to get through, which could mean the floor above is not protected. A firestop inspector needs to verify that the installation was done properly. That is, an inspector must ensure that the system protecting the curtain wall from an interior fire meets code requirements and ASTM E 2307. Between the required perimeter fire-barrier components and the above five key elements to have a successful system, two things stand out: first, this process must be a team effort that includes everyone from the project’s architects and construction team to the component manufacturers, installers, and inspectors. Second, a quality EJ can help ensure that the assembly is appropriate for the project, especially when a contractor encounters unanticipated problems, or when the conditions in the field differ from the original design. Every so often, a project hits a point where the original design simply does not work in the construction phase. In the case of perimeter fire barriers or firestops, this can be a difficult and expensive problem because it is too late to redesign the original solution. In this case, the project requires an alternate protection solution that will maintain the system’s integrity. This alternative recommendation is communicated through an EJ. Here a trained technical specialist or engineer can help a project team by interpolating and analyzing information about the situation and recommending alternative methods that help ensure the perimeter fire-barrier system will perform as needed. Must be project specific in that it clearly addresses the precise project conditions that are being evaluated. Must reference the third-party tested system that most closely represents the project construction details as the basis of design; this is to ensure that the hourly F-rating can be properly evaluated. If possible, other tested systems should be used for comparison. Must provide a complete description of the critical elements of the system, including the tested and listed system’s design criteria that are required to make the system work. The EJ must be based on interpolation of previously tested fire-barrier systems that are similar to the condition upon which the judgment is given. Must NOT be used to circumvent testing new fire-containment assemblies. EJs must have good data to interpolate/extrapolate within the boundaries of good design practices in question; if they do not, this should be a red flag that fire testing is needed. Must state that it is an EJ and not a tested and listed system. What Happens When a System Fails? Testing reports and EJs are especially important when a tested system fails. Why? Because that test information can help assessors design appropriate, fire-safe recommendations. Let’s say, for example, that a manufacturer has tested a spandrel condition that was 24 inches tall, and in the project the spandrel is 20 inches tall. During the testing, the curtain wall attachment points deteriorated only 2 inches, but that was enough for the attachment points to be compromised. In the EJ, the manufacturer may recommend that the attachment points be moved to a higher point than where it deteriorated in the actual test. Through the test—and component failure—the manufacturer can make a better recommendation for a safer system. Exterior wall system designs vary tremendously, which means that it can be difficult to ensure that a perimeter fire-barrier system is designed to protect the joint and the wall system. Section 715.4 of the 2015 IBC requires that only approved perimeter fire-containment systems be used. Such systems are specifically designed and constructed to protect the perimeter of an aluminum-framed curtain wall in accordance with ASTM E2307 and the IBC. However, the IBC recognizes that every building differs in its design details, and so EJs may be required to help the project team adjust the design to ensure that the containment system will function as needed for the specific site. ASTM E2307 is the standard designed to test and measure how well a perimeter fire-barrier system can maintain a seal and prevent interior fire from spreading as the exterior wall assembly deflects and deforms when exposed to fire. The goal is to determine how long the perimeter fire barrier will prevent the flame from penetrating through the opening between the wall assembly and the floor assembly. The test focuses on the interior joint, which is protected by the perimeter fire-barrier system. ASTM E2307 exposes the joint to fire from the room of origin and the exterior wall to fire from both interior and exterior as the fire plume exits the room through a window opening. The fire exposure conditions used for the first 30 minutes are outlined in the ASTM test method, and then they parallel the ASTM E119 time-temperature relationship for fire resistance.